Many Japanese learners lack a knowledge of English "patterns" such as Why don't you __?, or Has anyone ever told you that ___? Yet, native speakers of English rely heavily on such linguistic patterns when conversing. By teaching these patterns to Japanese students, ESL instructors can help their students achieve English conversational fluency. In the following procedure, the teacher takes students through three steps. The instructor first identifies the target pattern, then teaches form and meaning, and finally encourages students to use the patterns in context. Moreover, the following procedure relies heavily upon the use of drama techniques. Although there are many ways to use drama in the second language classroom, the following activities rely most heavily upon the use of two drama strategies in particular: role-play and student written dialogues. When role-playing, students must speak spontaneously as they assume a different identity. Role-playing is beneficial because it requires students to engage in an essential aspect of acquiring a language&emdash;risk taking. Similarly, writing original dialogues forces students to be original and imaginative. Both are critical when communicating in a second language. An important aspect of using drama in the classroom is the use of props. These can be made out of classroom objects (e.g., a projector becomes a cash register), or provided by the teacher or students. Glasses, wigs, old jewelry, or scarves all help to create new contexts in which students can practice the second language. Step 1: Each week, create a list of 10 English patterns. Alongside each, note its purpose or function (e.g., suggesting, interrupting). Japanese translations of functions aid comprehension and accelerate acquisition. Next, write two-line mini-dialogues for each pattern. Step 2: Distribute copies of the week's list to students. Review the pronunciation of all patterns and the meaning of unfamiliar vocabulary. Student pairs quiz each other on the functions (English or Japanese) and their corresponding English patterns. Step 3: Simulated Dialogues. Write brief descriptions of social situations necessitating the use of the English patterns. Have students read the descriptions, then ask individuals or pairs to write the appropriate English patterns. 1. In the newspaper you read about some Hawaiian shorts that are on sale at the Robinson's-May department store. You arrive at the store, but you are lost. You decide to stop a red-haired woman who is dressed in tight-fitting pants and high heels. You ask her for information regarding the location of the sportswear department. 2. Following her directions, you finally find the sportswear department. You look, but cannot find the shorts in size 7, so you decide to get help from the saleswoman. The saleswoman is talking to another customer. You have been waiting patiently for 20 minutes, when you suddenly notice that the saleswoman's face is turning bright green. You decide to interrupt their conversation in order to inform her of this. 3. After searching, the saleswoman cannot find the shorts in your size. The saleswoman apologizes and reports this disappointing information. Step 4: Provide answer sheets. You: Excuse me. Could you please tell me where the sportswear department is? You: Excuse me for interrupting, but your face is bright green. You (Saleswoman): I'm afraid that there are no shorts in size 7. Step 5: Role-Plays. Have pairs write six role-play commands. Next, place two pairs of students together. One pair will read aloud a command while the others role-play, using the appropriate English pattern. Pairs take turns commanding and role-playing. Step 6: Student Written Dialogues. 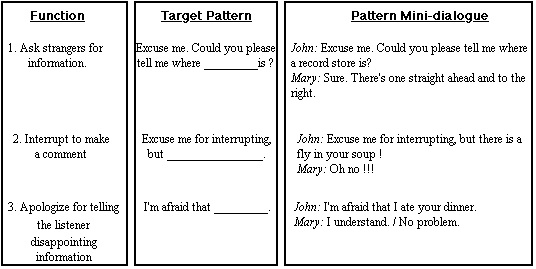 Have groups of three write dialogues using all of the week's patterns. Target patterns should be underlined. After grading dialogues, have students perform them for the class. An American girl, named Jennifer just arrived at Narita Airport. She is going to stay in Japan for a month to teach English at high school. She is looking for a telephone, and there are two businessmen beside her. Jennifer: Excuse me for interrupting, but could you please tell me where I can make a call? Businessman: I'm sorry but I don't know. Perhaps you could go to the information counter over there. Drama is a powerful vehicle in the second language classroom. By using such strategies as the procedure outlined above, students build confidence in the process of practicing English. Acquiring a second language is active, rather than passive, and enjoyable rather than boring. It is not surprising that student motivation is high. By teaching English in the way described, ESL instructors can foster the Japanese learner's English fluency.